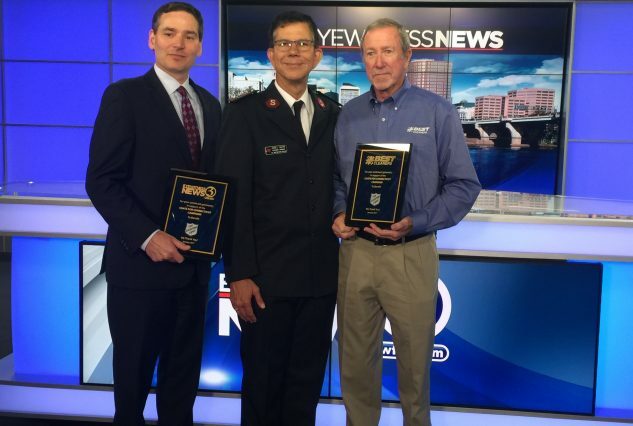 The Salvation Army officially recognized Best Cleaner’s 2016 COATS FOR CONNECTICUT campaign efforts with an award presentation at WFSB-TV 3’s studio in Rocky Hill. Major Jorge Marzan thanked Gary Reynolds of Best Cleaners and Klarn DePalma of WFSB, Best’s COATS FOR CONNECTICUT media partner, for the close to 20,000 coats that were collected, cleaned and delivered to Salvation Army centers throughout the state last November through January. A bigger THANK YOU goes out to everyone in the community who took the time to donate their gently-used, sometimes brand new, winter coats.